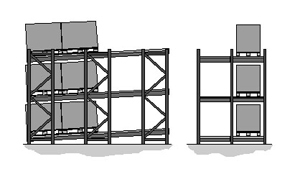 If your warehouse operates using the FILO (First In, Last Out) principle then push back pallet racking is for you. Most suitable for the storage of bulk items, Dexion P90 pallet racking is used to create a push back racking for pallet storage. The Dexion racking slopes on rollers and all pallets are accessible on a FILO basis. Also known as dynamic pallet racking, Dexion Push Back enables the storage of pallets up to ten deep. Once the front pallet has been picked, the next pallet rolls forward automatically in a gentle and controlled fashion under the force of gravity. 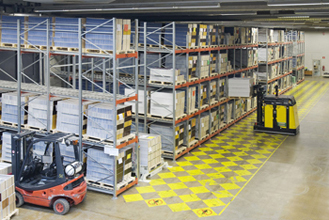 Pallets stored in a push back system are only accessible from the front pick face, and cannot be reached until they roll forward. Similarly to roller push back is suitable for the storage of bulk items, Dexion Cart push back pallet racking allows you to store up to four pallets deep per level. Pallets are placed on the carts that are fitted onto sloped p90 storage lanes and pushed back along the rails when new pallets are added. The balanced incline of the Dexion push-back racking structure means that pallets towards the back of the lane move forward when the pallet at the front is removed. Operating on a FILO basis. 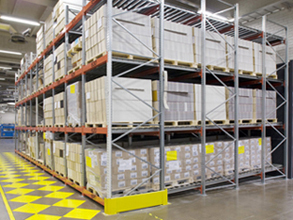 Based on the Dexion P90 pallet racking system, Dexion Push Back is a dynamic storage solution for the warehouse. Each new pallet pushes the existing stock backward into the depth of the racking. This makes Push Back racking ideal for bulk storing items and slow moving stock. BSE UK supplies Dexion Push Back Pallet Racking – call now on 01179 555211 to discuss your requirements with a member of the team.